Bishop Samuel Adjai (Ajayi) Crowther (c. 1807 - December 31, 1891) was a linguist and the first African Anglican bishop in Nigeria. Born in Osogun, Yorubaland (in today's Iseyin Local Government, Oyo State, Nigeria), Rev. Dr. Samuel Ajayi Crowther was a member of the Yoruba ethnic group. Ajayi was captured by Fulani slave raiders in 1821 and sold to Portuguese slave traders. Before leaving port, his ship was boarded by the British Navy, and Crowther was taken to Freetown, Sierra Leone and released. While there, Crowther was cared for by the Anglican Church Missionary Society, who taught him English. He converted to Christianity, was baptized by Rev. John Raban, and took the name Samuel Crowther in 1825. While in Freetown, Crowther became interested in languages. In 1826 he was taken to England to attend Islington Parish School. He returned to Freetown in 1827 and attended the newly-opened Fourah Bay College, an Anglican missionary school, where his interest in language found him studying Latin and Greek but also Temne. After completing his studies he began teaching at the school. He also married Asano Susan, a schoolmistress, who was also on the Portuguese slave ship that originally brought Crowther to Sierra Leone. In 1841 Crowther was selected to accompany the missionary J.F.Schön on an expedition along the Niger River. Together with Schön, he was expected to learn Hausa for use on the expedition. The goal of the expedition was to spread commerce, teach agricultural techniques, spread Christianity, and help end the slave trade. Following the expedition, Crowther was recalled to England, where he was trained as a minister and ordained by the bishop of London. He returned to Africa in 1843 and with Henry Townsend, opened a mission in Abeokuta, in today's Ogun State, Nigeria. Rev. 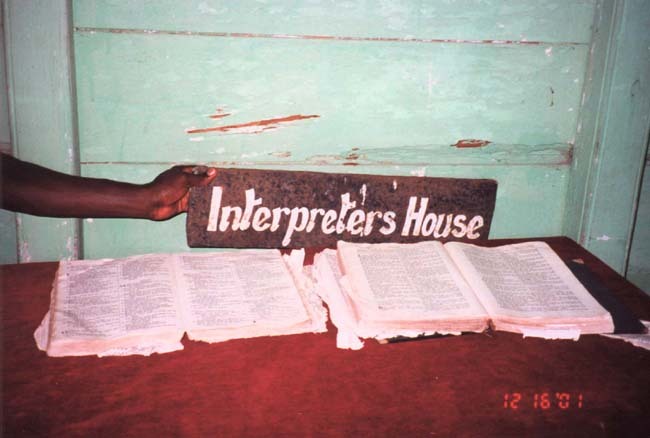 Dr. Crowther began translating the Bible into the Yoruba language and compiling a Yoruba dictionary. In 1843, a grammar book which he started working on during the Niger expedition was published; and a Yoruba version of the Anglican Book of Common Prayer followed later. He also began codifying other languages. Following the British Niger Expeditions of 1854 and 1857, Crowther produced a primer for the Igbo language in 1857, another for the Nupe language in 1860, and a full grammar and vocabulary of Nupe in 1864. 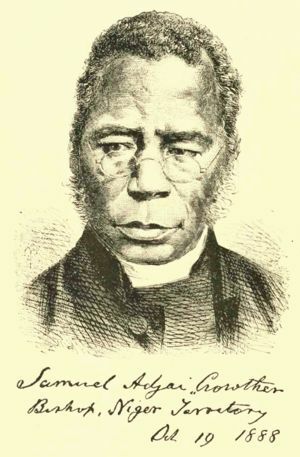 In 1864, Crowther was ordained as the first African bishop of the Anglican Church. That same year he also received a Doctor of Divinity from Oxford University. Bishp Dr. Crowther's attention was directed more and more to languages other than Yoruba, but he continued to supervise the translation of the Yoruba Bible (Bibeli Mimọ), which was completed in the mid-1880's, a few years before his death. In 1891, Crowther suffered a stroke and died the last day of that year. Hair, P.E.H. (1967). "The Early Study of Yoruba, 1825-1850", The Early Study of Nigerian Languages. Cambridge: Cambridge University Press. This page was last edited on 2 June 2008, at 12:10.